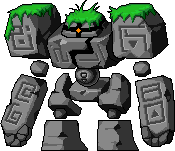 A Stone Golem monster which had been infected with an evil aura that had permeated throughout the depths of the forest, leaving the forest in ruins and annihilating the Stone Golems that were guarding the Stone Golem's Temple. The Dark Stone Golems who had inadvertently caused a detrimental effect on the Temple decided to finish their duties by going into Sleepywood. But it is said that some Dark Stone Golems frequently appear in the Golems' Temple.